Whoa, Uncle Chael has been preaching the same lines for so long that he’s almost got me brainwashed. 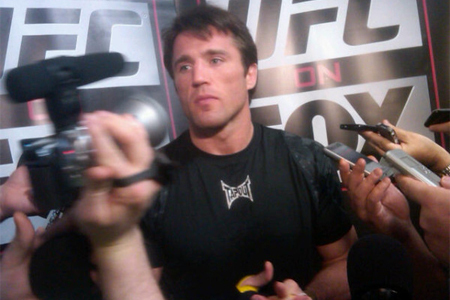 Alright, so most of the things written above aren’t true, but just don’t tell that to Chael P. Sonnen. The one-time political hopeful has claimed for over a year that he’s the true owner of the UFC middleweight belt, and today while appearing as a guest on ESPN2’s “Dan LeBatard is Highly Questionable” he flaunted his bling-bling for the entire world to see. Sonnen and Bisping collide this weekend inside United Center in Chicago, Illinois. The victor advances to challenge “The Spider” for his middleweight title later this summer.